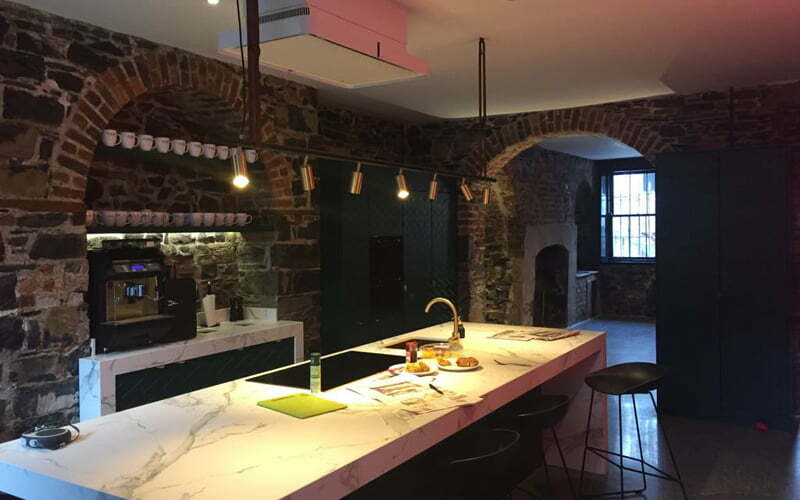 We were very proud to be part of the team that transformed a dated Georgian town house on Merrion Square in to an ultra-modern, 21st century work space. 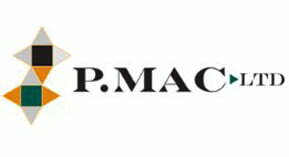 The building has now been renamed the Dog House and occupied by Iconic Offices, the leaders in amazing work spaces. The Georgian town house, like many of the buildings on the square, had been used as offices for a number of years, but was fairly neglected. It was a dated ensemble of musty carpets, faded linoleum and crumbling plaster. 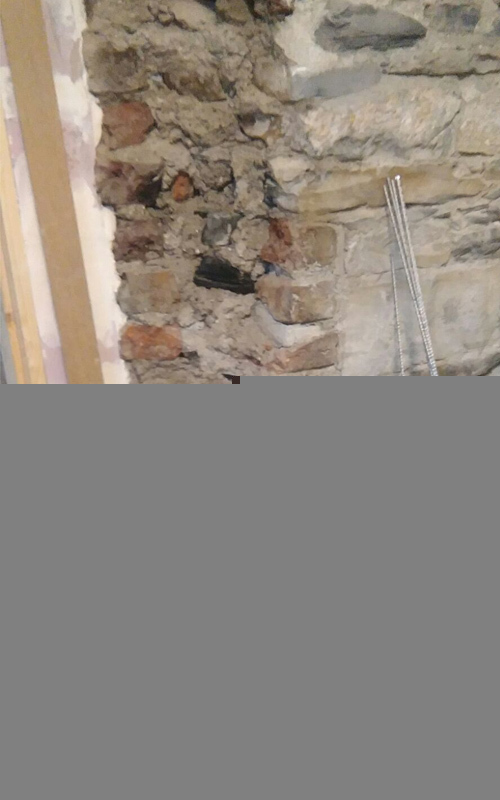 During refurbishment works, the main contractors, Precision Building Services, tore down the crumbling plaster and wall coverings in the basement and revealed the original stone walls. They called us in at this point to see if the walls could be cleaned and re-pointed. The basement consisted of vaulted ceilings, walls and majestic old fireplaces – in brick and stone. It was a beautiful find, but in parts the brickwork was in very bad condition. Bricks were crumbling or missing, and quite a few had had holes drilled into them at some stage. 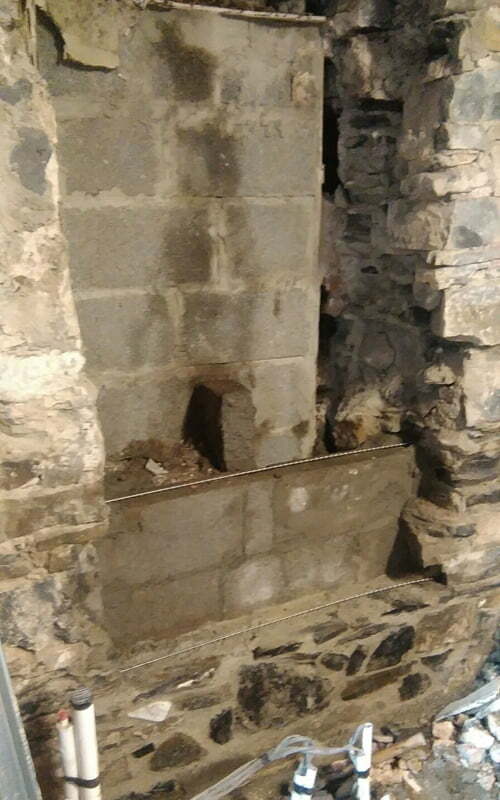 Large pieces of limestone were missing from the walls, and in one place a whole section of the wall was missing where a cupboard had been inserted. This is the type of project that we just love to get stuck into! It gives us great pleasure to transform and restore our beautiful heritage craftsmanship back to a useable and beautiful space. To top it all off, they also wanted to pour new concrete floors and polish them to a platinum finish. 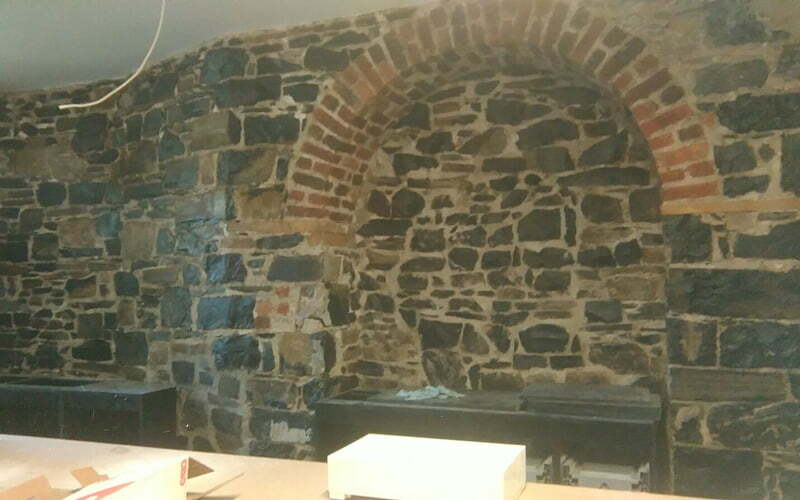 Our initial task was to clean down all brick and stone work to reveal the substrate. We used the Systeco Tornado Blast Unit. This is a vac blasting system that gently cleans all brick and concrete and most importantly doesn’t create any mess or dangerous dust. Once the substrate was revealed, we could see the extent of repairs that were required. There was a substantial amount of restoration required. 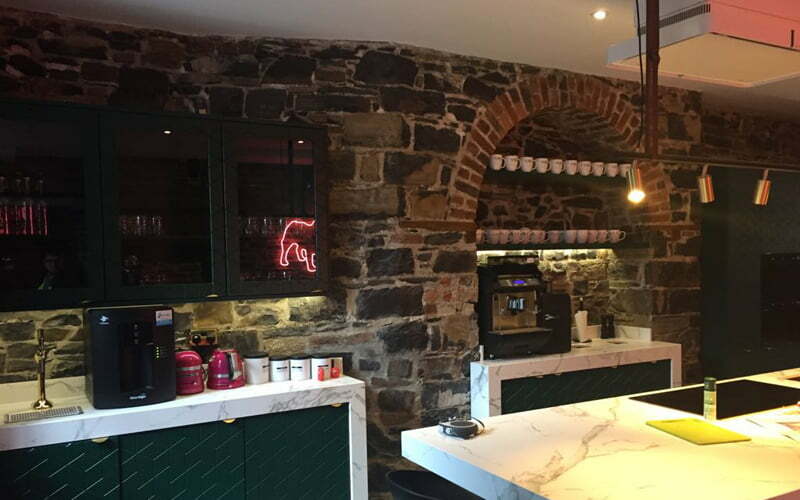 We needed to source limestone blocks and red bricks that would blend in with existing walls. 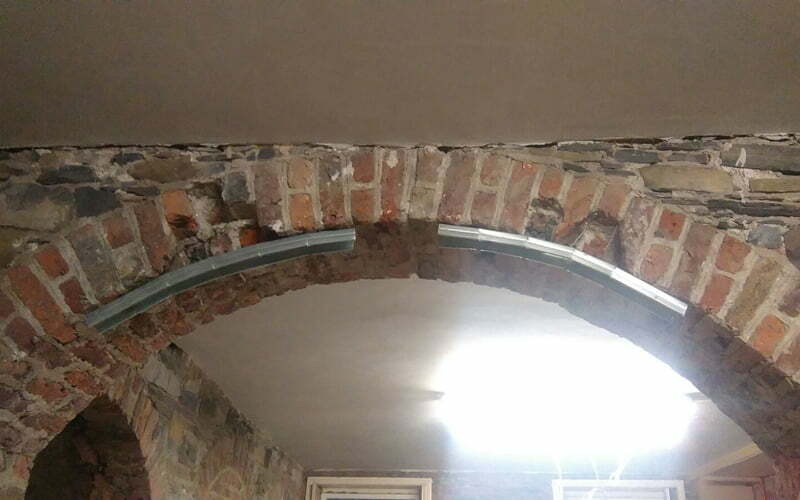 The brick arches were also in poor condition, and these all had to be re-pointed and filled with lime mortar to make them sound. Parts of the limestone walls were missing and had to be rebuilt using salvaged limestone blocks that we matched as closely as possible. By the fireplace, there was an old chimney door that had been covered for years and was very loose. The blocks around it were also loose. 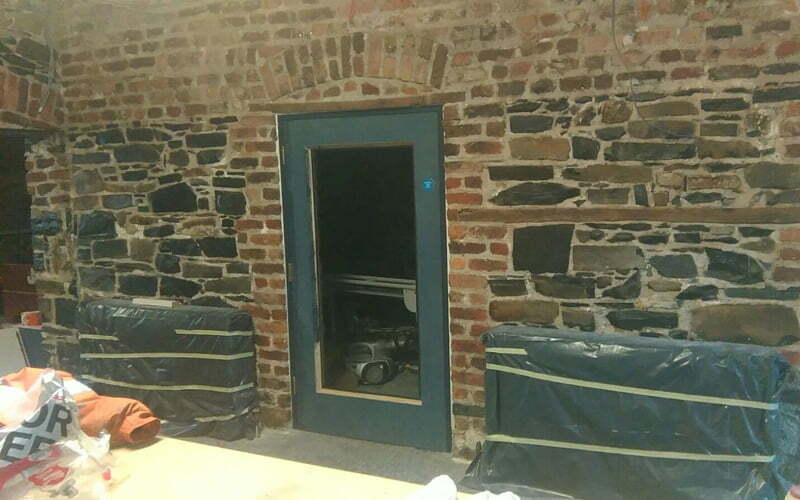 We cleaned the door and re-installed it the correct position, building the wall around it so that it’s now as sturdy as the day it was installed, back in the 18th century. The corner blocks in the walk-through areas were missing in places, while others were very loose. 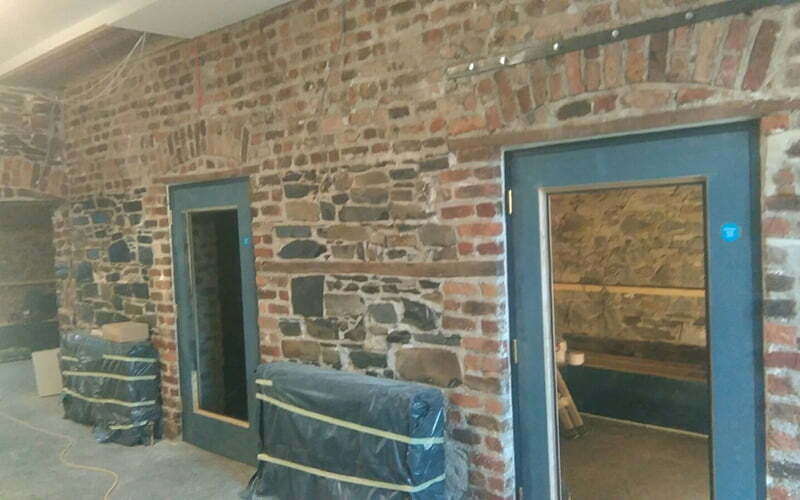 We made the existing blocks secure using helibars and lime mortar and then replaced any missing ones with salvaged blocks, to blend in with the existing walls. At some stage, there had been a lot of holes drilled into the limestone blocks – probably to take cladding – and all these blocks needed to be replaced. It wouldn’t have been possible to just fill the holes in; because the stone is being left bare, this would have ruined the overall appearance of the walls. In one place, part of the limestone wall had been knocked down to allow for a cupboard space. 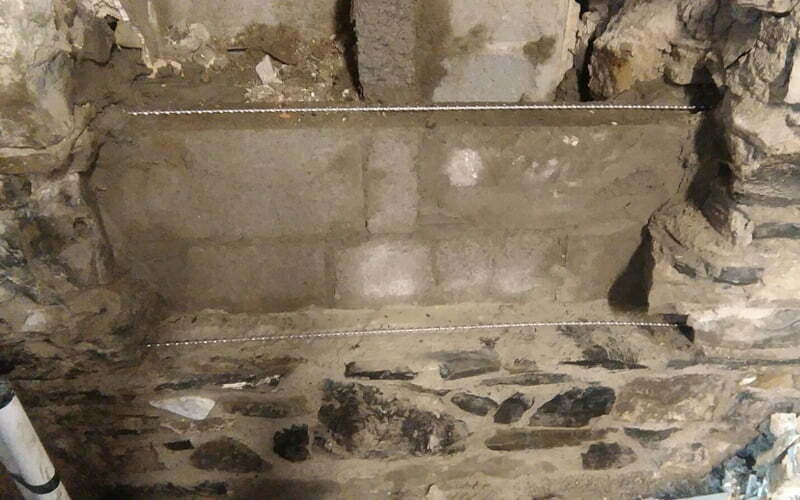 We built the back of the wall up using cement blocks, then matched in a new limestone wall and pointed it using lime mortar. Once all cleaning and restoration works were carried, out we needed to seal everything to inhibit dust. 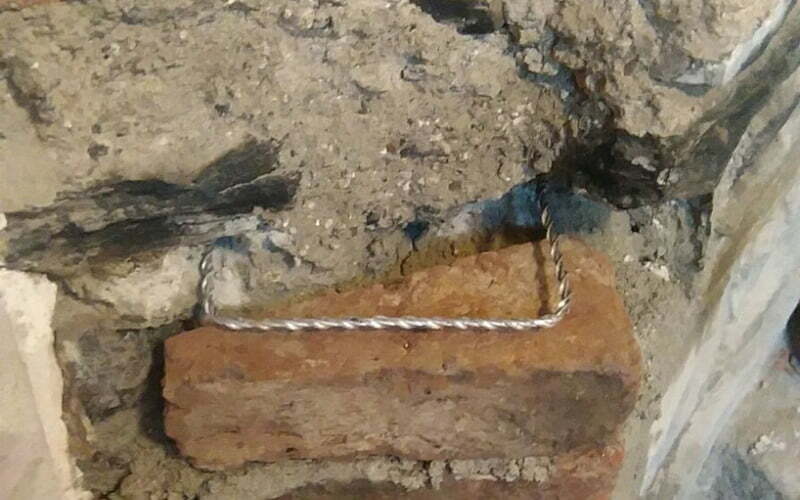 This was a penetrating seal that didn’t change the look of the stone or bricks and left the masonry with its naturally dry appearance. 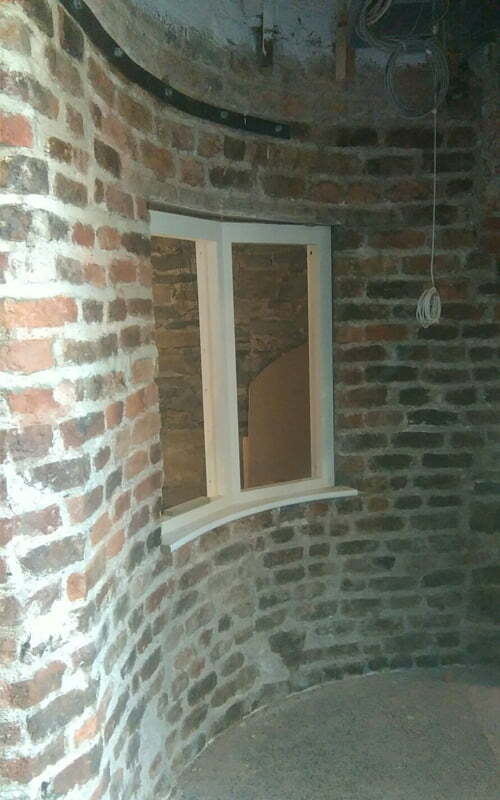 The client then asked if we could enhance the look of the stonework, so we applied an enhancing seal which protects the stone and bricks from staining, inhibits dust, but (most importantly) allows the stones to breathe so that moisture can get out and not cause dampness. The enhancing seal had the added advantage of giving the stone and brick a wet look which enhanced colour. 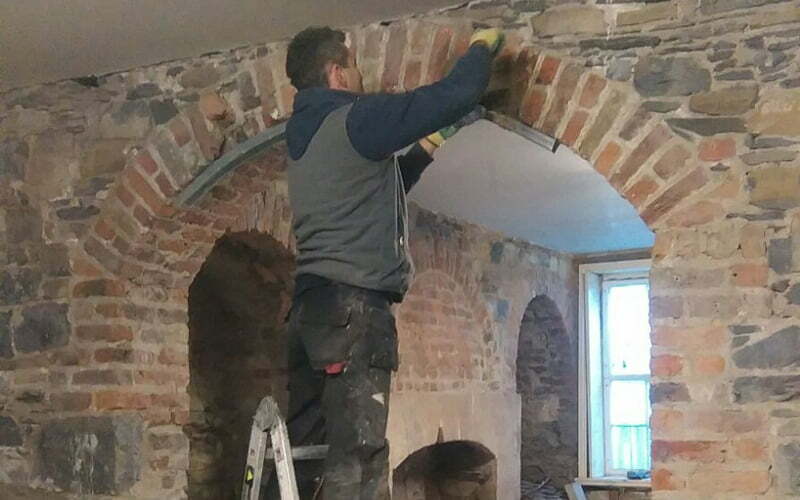 All works were carried out with best Heritage principles in mind and met all the requirements of the conservation architect responsible for the project. All together, this work took just one week to complete. 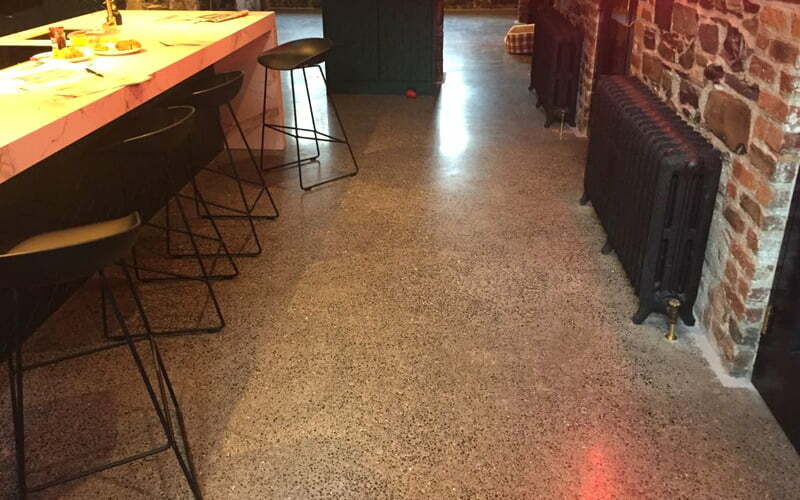 Meanwhile… the newly laid concrete floor had been drying out nicely beneath our feet, and was fully cured and ready for grinding and polishing. The concrete had been expertly poured and was smooth to the touch. 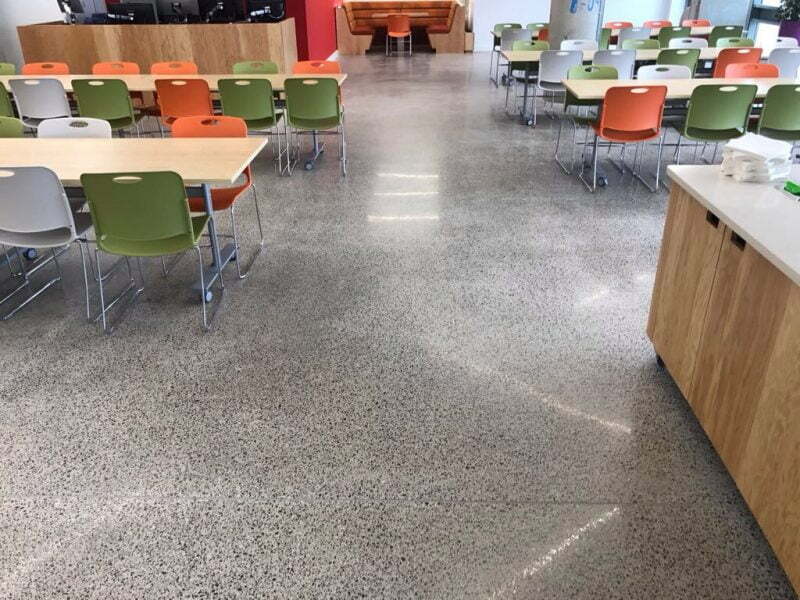 We ground and polished the concrete to expose the aggregate and brought it up to a 3,000 grit – which is a highly polished finish. 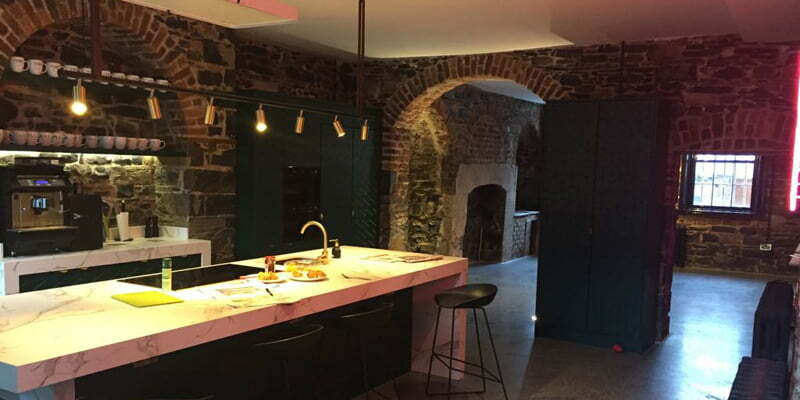 The blend of the old limestone, red brick and contemporary polished concrete floor is stunning. 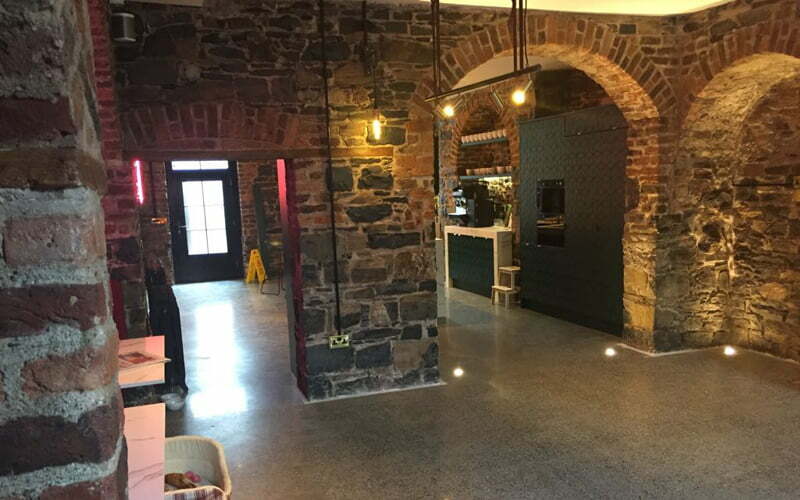 The basement has been kitted out as a communal kitchen and dining area with quirky little seating arrangements in the alcoves for quiet chill-out time. What was once almost certainly a bustling busy kitchen with roaring open fires working hard to serve the aristocracy upstairs is now a very trendy and hip communal area for the creative minds on the upper floors of this fantastic work space.